Printers and Scanners - PC Buyer Beware! Click on Printer Problems to be provided a list of the ones dealt with on this website. Here is a one that covers solving a wide range of problems: Printer troubleshooting: Fixing printer problems in Windows 7/8.1/10. All printers manufactured by the major manufacturers provide user-friendly, illustrated instructions on how to install their printers and all-in-one MFPs, often in the form of a quick-start sheet, and always in the user manual. Some printers require the device-driver software, usually provided on a CD/DVD or downloaded, to be installed first, followed by the connection of the printer to the mains electricity supply and the computer and others require the software to be installed after the printer has been connected to the mains electricity, a USB port on the computer (or a network if using a wireless connection) and switched on. Most people have little or no problems following the instructions and getting their printer up-and-running. If, say, you can’t connect your new printer using a wireless connection, reading the purchaser reviews on Amazon often provides a solution. Contacting the manufacturer’s support site is always an option, which is why you should register it online or by post as soon as possible. Printer manufacturers, such as Dell, provide you with a registration tag that gives you access to the Dell support site. Many printers can print directly from a Secure Digital (SD) Card (aka memory card) without being connected to a computer. All photo printers have the capacity to read data directly from the memory cards used by digital cameras. Such printers usually offer advanced layout and quality options and can also be used as a memory card reader when connected to a computer. Just make sure that a photo printer with such a facility supports the same memory card format as your digital camera. Most business-class printers allow the amount of RAM memory they use to be upgraded, which is usually not the case with inexpensive printers used in the home. The more memory a printer has, the more data it will be able to hold for printing jobs. Most home printers only need enough memory to hold a print job of 10 or fewer pages, which hardly uses any memory. If you are doing a big printing job of a large file, say, the file containing an entire 500-page book, and the printer runs out of memory to store that print job, it will fail. Printer memory is available from Crucial for all of the major brands of printers. Shipping is free and the memory is guaranteed to work or you get a full refund. Crucial provides a drop-down list of all of the makes/models of printers the memory of which can be upgraded. RAM memory very rarely goes bad and should last longer than the life of the computer or printer using it. 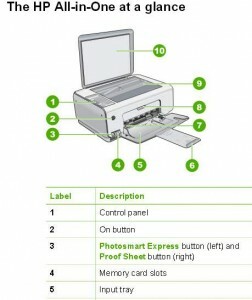 This section of this website provides detailed information on inkjet and laser printers and, to a lesser extent, scanners. Printers and scanners are mostly connected to laptop and desktop PCs wirelessly via a network’s Wi-Fi or via the USB interface, which has recently reached version 3.0/3.1, called SuperSpeed USB, which has data-transfer speeds of up to 5 Gbit/s for version 3.0 and 10 Gbit/s for version 3.1 – ten and twenty times, respectively, faster than USB 2.0, which has a maximum data transfer speed of 480 Mbit/s (almost 0.5 Gbit/s). Most new printers can connect wirelessly to a home or office network automatically – even the cheapest but still excellent all-in-one models, such as the HP DeskJet 3630 All-in-One Printer, Scanner, Copier costing £40 (March 2016). I have an HP PSC 1410 printer-scanner-copier that cost me $40 which is 10 years old and still working perfectly, but is doesn’t have wireless capability. Here is a quote from an online review of this device: “I am very pleased with the quality and features of this printer, given the low price at the time of purchase. It pretty much set itself up – I didn’t even need to enter the network SSID or password, it used a direct networking feature. It has been working perfectly now for several weeks, and despite photocopying over a hundred pages in black and white, it still shows a full cartridge of black ink. The quality of the print is excellent too.” That inexpensive printer also allows connecting a smartphone or tablet directly to it and print without accessing a network. He must have had his network router’s WPS feature – that most routers provide – enabled. It is usually enabled out of the box to make connecting devices automatic. Note that there are security issues with this feature enabled. It is best to disable and then enable it in the router’s configuration setup to add a device and then disable it. Visit the Networking: Cabled and Wireless Wi-Fi section for information on home/office networks, including disabling/enabling WPS. Many old printers and scanners use the legacy parallel port that most desktop-PC motherboards have dropped from their ports panel and which stopped being offered by laptops long ago to save port space. USB-to-Parallel and Parallel-to-USB adapters are available for those of you who want to continue using your trusty old parallel printers. There aren’t many computers these days that aren’t attached to an inkjet or laser printer, or a multifunction peripheral (MFP), also known as an all-in-one, that can print, scan and copy documents. MFPs are available as inkjet and laser models. Some MFPs can also send faxes and most of them can read a wide range of memory cards directly without going through a computer. Some MFPs now have touchscreen controls, such as the HP Laserjet Pro CM1415fn, a colour laser MFP, which has a superb, very user-friendly, full-colour touchscreen control panel. As time goes by, most printers and MFPs will have touchscreen capability, as will most laptops and desktop PCs. Many printers, such as photo inkjets, have memory-card readers that read the memory cards used in digital cameras, and many of them also have a large colour screen that allows you to select photos to print and preview the results of editing features, such as red-eye correction. You should be sure to buy a printer with a memory-card reader that supports the card format used by your digital camera. Duplex printing is the ability of a printer to print on both sides of a sheet of paper. After a pause to allow the ink to dry, each page is drawn back into the printer for a second pass. It’s an excellent way to save paper, but the interval between printing one side of a page and the other side makes duplex printing a much slower process than single-page printing. Duplex inkjet printers, which can also print single pages, are not significantly more expensive than ordinary inkjet printers as used to be the case. Printers and MFPs can use printheads that are a replaceable part of the machine or printheads that are part of the replaceable ink cartridges. The printers and MFPs that use cartridges with printheads use a few cartridges, such as one for colour and one for black. 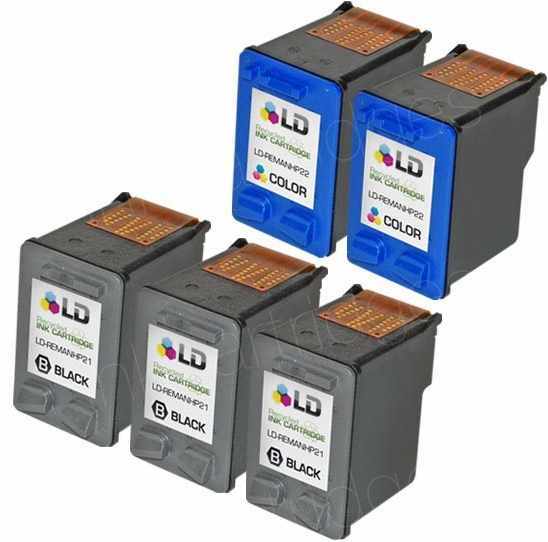 The machines that use many ink cartridges – 4, 6, 8 – usually use built-in printheads, because the cost of using cartridges with printheads is prohibitive. Both options have their pros and cons. Built-in printheads wear out and might be difficult to replace or get dirty after long use and have to be cleaned by a routine built into the machine, whereas the ink usually runs out in a cartridge before its printhead needs to be cleaned. Ink cartridges that have a printhead are quite a bit more expensive than those without a printhead. Using the much cheaper compatible or refilled cartridges rather than using the machine manufacturer’s new cartridges is much more certain of working if the printer uses printheads because the cartridges don’t have any built-in electronics. The image below shows the electronics at the top of HP 21 and 22 re-manufactured, re-branded cartridges using the original HP cases. Those cartridges have a built-in printhead. The manufacturers of inkjet printers that have the printhead built into the printer warn users that the printhead can be damaged if the ink is allowed to run out. Therefore, they advise users to replace cartridges just before they run dry. Such printers are not delivered with ink already in the print-head. The printers are shipped for sale with an oily substance in the print-head. That is why it can take a long time to ‘prime’ the printer for its first use. The process can take up to 15 minutes for photo printers. The printer has to clear all of the oil from the print-head and dump it into the waste reservoir and then replace it with ink before the printer can be used. Some printheads can be replaced by the user (e.g., Canon) and others require to be installed by a technician (e.g., Epson). The printheads of some printer and MFP manufacturers for some models – usually the more expensive series – can be obtained easily. Below is a link to a dealer that sells Canon printheads for certain models. I have no idea how comprehensive the list is because it is difficult to find out if a particular printer uses printheads or cartridges with printheads, since the machine specifications usually don’t supply that information. The best way to find out is to ask the machine manufacturer’s support via its website. If a printer or MFP uses ink cartridges that have a built-in printhead, compatible cartridges made by another manufacturer won’t be available because of the huge expense of the equipment that is used to make them. In that case, cartridges will always be refilled and resold under another brand name as being compatible cartridges. For that reason, those cartridges are far more likely to fail to work or not work as well as the printer-manufacture’s cartridges. The far more simple ink cartridges that feed printheads built into the printer can be made by third-party manufacturers and can legitimately be described as being compatible with the machines that can use them and are therefore far more likely to work as well as the printer-manufacturer’s cartridges. Note well that if you use cartridges other than those supplied by the manufacturer, you can render the machine’s warranty void. Therefore, if you send a printer back to the manufacturer always have authentic cartridges installed. This wording is specifically designed to comply with the Magnuson-Moss Warranty Improvement Act which was passed by the US Congress in 1975. The Act does not allow warranty exclusion based purely on the use of third-party consumables. HP’s warranty policy with regard to using third-party consumables should be valid wherever it sells printers. Make sure that you keep the packaging the PC came in if you have a RTB or C&R warranty, because the company providing the service will probably ask you to return it in its original packaging. If you send it back in what that company considers inadequate packaging, it might refuse to do the repairs on the pretext that the PC was in good order and that the damage occurred in transit due to the inadequate packaging. In short, do everything you can to avoid giving the vendor an excuse to call your rights into question. Moreover, remember that monitors often come with separate three-year warranties, so in case your monitor packs in after the first year, it is worthwhile checking if the monitor come with a separate warranty of its own. Most monitors that are purchased separately come with a three-year RTB or on-site warranty, as do hard disk drives. Visit the PC Warranties section of this website for more information on them. Inkjet printers use between 2 and 6 cartridges filled with ink; a laser printer uses a single toner cartridge filled with fine powder and a heated fuser. Colour Laser printers are now inexpensive enough to be used by home users, but inkjet printers still dominate the home-printer market and are the best choice for photo printing. Mono laser printers that can only print in black used to be the only kind of laser printer available. They are still available, indeed are the best choice of all printers from a cost point of view if you don’t need colour printing. At the moment, laser printers can’t print to photo paper nearly as well as inkjet printers. Laser printers are really only better than inkjet printers for business users who do a lot of mono printing, because the cost and speed of printing between inkjets and lasers has narrowed significantly. The printer manufacturers usually provide the printing speed in pages per minute in black and colour and the typical cost of printing a page of back text and a colour print. If not, reputable review websites often provide that information derived from their own testing. If you use decent-quality card stock (200gsm and above), the feed mechanisms on inkjet printers tend to wear out quickly. It is therefore best to use a laser printer that can handle up to 215gsm paper. Note that laser printers make use of more components than an inkjet printer. The most basic models have an integrated OPC drum, which makes maintenance easy but results in higher print costs. If any parts can’t be replaced, such as an integrated OPC drum, the printer has to be junked when that part fails. More expensive laser printers have separate (replaceable) OPC drums, waste toner bottles and fuser units, which may need to be replaced, resulting in hidden costs that negate the savings made if the toner cartridges are cheap. Indeed, it may be a cheaper option to buy a new printer than to replace replaceable failed components. The cartridges used by an inkjet printer and the toner cartridge used by a laser printer can be refilled relatively cheaply compared to buying the new products made by the printer manufacturers, but this is a haphazard business – it can work or it can fail, depending on the level of expertise used to refill them. I tried using refilled inkjet cartridges, but went back to buying new ones that always worked. I have bought refills guaranteed to work that never worked immediately or failed to work shortly after installation. Note that most inkjet printers and an increasing number of laser printers have a ‘soft’ power button instead of an on/off switch, which means that the printer is never switched off, but enters a low-power state when powered down that draws a few watts of power. A laser printer uses more power than an inkjet in this state because it has a larger power supply. In any case, the longer the power supply unit is left on the shorter its life expectancy, so if you are not going to use a printer for a lengthy period, switch it off at the mains. I do that anyway with my HP inkjet printer because there is a small industry supplying replacement power mains adapters for HP printers. Every desktop printer and MFP has an automatic document feeder (AFD). Small portable models may not have an ADF or one that holds only a few sheets of paper. The number of pages that the AFD can hold varies from printer to printer. If you put more pages into it than it can handle, the printer will probably grab more than one page. Click the following Bing Image search to view thousands of images of all kinds of printers, some of which are annotated drawings that show the components. The following comprehensive buying guide looks up-to-date, unlike most of the guides I found. Since Google decided to put paying adverts at the top of its search results in 2011, sites no longer made the top of the search results or the first page of results and lost most of their visitors, making it not worthwhile to provide up-to-date information. Consequently, most of the IT-related information is out of date. A Continuous Ink System also known as a Continuous Flow System (CIS/CFS), is a bulk feed ink system that available for certain makes/models of inkjet printers. A CIS/CFS system uses large (about 100ml/color) ink tanks that are connected with tubes to the printhead nozzles. The tanks can be refilled from an ink bottle or sometimes from a syringe. You can make huge cost-savings by using a CIS system if your printer or MFP uses original cartridges that only have very small amounts of ink in them, such as the standard (5ml) HP 21 and 22 cartridges, the XL versions of which provide a decent amount of ink (20ml). Note that this system is not available for all inkjet printers and MFPs, only certain makes/models. 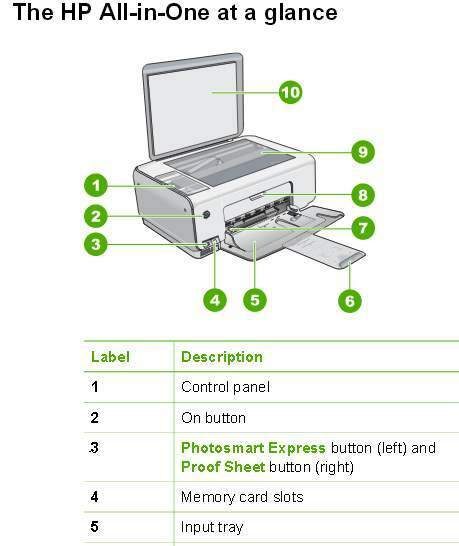 Many MFPs can make photocopies and print photos directly from a digital camera that supports the common PictBridge USB standard. Many MFPs with memory-card readers can print images directly from the cards they support, and some of them can scan directly to USB flash drives or supported memory cards. Most photo printers have memory-card readers and can also print photos directly from a digital camera. Because they are space-saving and usually cheaper to buy than separate machines, many users are now opting to buy a Multi-function Peripheral (MFP) instead of a separate printer, scanner, and copier. However, on this page, most of the information is on separate printers and scanners, because most of it applies to MFPs. Remember that most MFPs and dedicated printers can connect wirelessly to computers within range and equipped with wireless adapters or connect to a wireless router. The printer will be given an IP address automatically using the host computer’s Dynamic Host Configuration Protocol (DHCP). In Windows and most operating systems, dynamic IP configuration is enabled by default in the networking settings. If that protocol is disabled, the networked computers and devices, such as a wireless printer, each have to be assigned a unique IP address manually within a particular range of IP addresses. The Networking: Cabled and Wireless Wi-Fi section deals with cabled and wireless networking, including IP addresses. Conduct a web-search for wireless printers to see what is available. 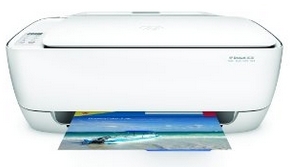 Even most of the cheapest all-in-one printer-scanner-copiers can have wireless capability. If you use an Ethernet network cable to connect a printer that does not have a built-in wireless adapter to a host computer that is connected to a wireless router, if you have File and Printer Sharing (F&PS) enabled on the host computer, the other computers on the network will be able to use the printer if they have its device drivers installed and the host computer is switched on with Windows running. To find out how to enable F&PS for the version of Windows you are using, enter the File and Printer Sharing, followed by the version of Windows, in a web-search engine. There are two ways of setting up a cabled/wireless network in Windows – Using the classic Workgroup (Windows XP to Windows 10) or using a HomeGroup, restricted to Windows 7/8.1/10. Visit Setting up a network using a Workgroup in any version of Windows or a HomeGroup in Window 7/8.1/10 for more information on those two methods. Printers with a built-in network adapter can connect to the router directly without the host computer being switched on and can then be shared by the other printers on the network. A non-wireless printer can be made to work wirelessly by connecting it to a wireless print server, widely available on the web. All of the computers that you want to share the printer must have that make/model of printer’s device driver installed. It can be a USB or a parallel printer. A parallel printer that uses a wide old pre-USB parallel port has to be connected to the print server with a parallel-to-USB (or USB-to-parallel) adapter cable that is widely available on the web for about £10. You can find them by using either of those terms as the search query in a search engine. Don’t be put off buying one of these by anyone who tells you that they don’t work or are unreliable, because I know of someone who has successfully connected 25 HP Laserjet 4100 parallel-port printers with these adapters, printing many thousands of pages a day. Most online websites that sell them also provide purchaser reviews, so be sure to read them before you make a purchase. Printers and MFPs running on Windows systems require software called device drivers to work. MFPs with several functions (printing, scanning, copying, faxing etc.) require special software provided by their manufacturers. There might not be a Windows device driver or the manufacturer’s software made available for an elderly MFP or printer. For example, I have an HP PSC 2510 MFP (printer, scanner, copier, fax machine). It was running on a desktop computer running Windows XP. I bought a new desktop PC running the 64-bit edition of Windows 7 Home Premium, which means that the 64-bit device driver is required. HP did not provide the Windows 7 64-bit software for this MFP at that time, but a basic printer driver was available. I got the computer to install it by entering the words printer troubleshooter in the Start => Search box in Windows 7. Clicking the provided link to the Printer Troubleshooter runs it. By following the instructions, I got Windows 7 to install the basic driver, but none of the other features – the copier, scanner and fax machine – could be used. To get those features back either the manufacturer would have to provide a 64-bit driver or I would have had to get a new MFP. Fortunately, I just use it for printing. There are articles on the web that provide information on how to correct device-driver problems that can be found by using a suitable web-search query. If, say, your printer stops working properly after upgrading your PC from Windows 7 or 8.1 to Windows 10, first try visiting the Support page of the printer’s manufacturer. If doing that fails, try using a search for the make/model of your printer plus the words Windows 10 drivers. Most inkjet and laser printers can print on envelopes. Inkjet printers that can do so usually have markings on their paper tray to show you where the envelopes are fed. However, laser printers usually have a feed slot specially for envelopes. The paper used in envelopes is thicker than standard sheets of A4 paper, so you have to set the printer’s driver to print to envelopes as well as to thick card paper. You can access the printer’s driver in Windows 7/10 by clicking Start => Devices and printers => Printing Preferences. The General tab allows you to choose the paper options (size and type). A standard bill envelope is 220mm x 110mm. There are options for different types of paper and cards, etc.